Every now and again I indulge myself with a blog which is really quite personal and this week’s – Inspirational People is one of those for me. I have a Pinterest board which is called Inspirational People and it is like having a grown up version of a childhood scrapbook. I am sure that most of you are familiar with Pinterest – for those of you who are not – take a look ! Anyway – Bob and I were having supper with friends the other night and he was asking our friend who were some of the women who she admired or inspired her – so that made me think of who is on my board and why they inspire me – and lo and behold a new blog started to take shape ! So here are some of the people who I have chosen and why I have chosen them but in no particular order. 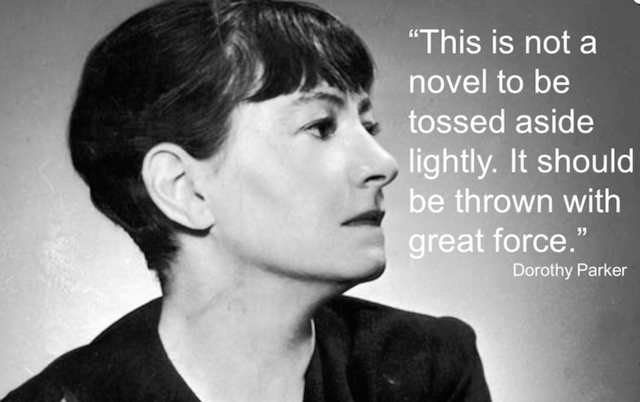 Dorothy Parker was a writer – a critic , a poet and a short story writer. I first came across her when I was about 18 – she was witty, vicious and a delight to read. She was also an alcoholic and suffered terrible depression – for me she represents my shadow side – she said and did all the things my hidden self might want to !! Nelson Mandela – here is a man whose love and humor shone out from his face. To have lived through all the misery that he did in prison and to come out with the compassion in his heart so strong is a lesson for all of us. Let go of your anger and open your heart. Diana Vreeland – magazine editor at Harpers Bazaar and then Vogue – from 1936 until 1971 – she was called the Empress of Fashion…. Stylish in her own way – never a slave to what was considered fashionable – she set the trends. Another woman who really did travel to the beat of a different drum ….. Witty with a unique view on life and hilarious ways of describing everything. Lastly – Lady Pamela Hicks – she is Lord Mountbatten’s daughter and mother to India Hicks. She is an icon of living history and witty and charming to boot. The sort of person who you would invite for tea and then ask to stay on for the weekend because you can’t hear enough of her amazing stories. What is so interesting for me when I write a blog like this is to see what are the themes that recur – and guess what – witty is a word I have used for all 3 women – I was going to change it but I guess that witty is important to me ! – and for the 2 men – compassion and love and humor seem to be the the most important themes ! Check out the Pinterest link to see who else I find inspirational …..
And by the way the 2 inspirational women that our friend came up with were Hilary Clinton and Mother Teresa.